Each year hundreds of children from across the City of Toronto audition for a place at Claude Watson School for the Arts. For information about how to audition, eligibility and the application please check out the Future Students section on our website. Welcome to Claude Watson School for the Arts (CWSA). CWSA is a dynamic school which offers an enriched arts education to students in grades 4 - 8. Each year we admit 60 students (30 boys and 30 girls) into our grade four program. 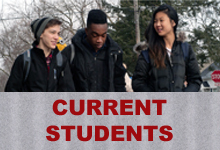 Students spend approximately half their day on the academic curriculum (language, french, math, science, social studies, health and physical education). The other half of their day is spent immersed in the arts. All students participate in dance, drama, music and visual arts. In Grade 5 students are introduced to digital arts. Claude Watson School for the Arts is proud to operate as part of the Toronto District School Board. CWSA is a publically funded school and does not ask families to pay tuition. 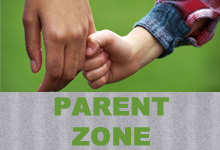 Each year there is significant interest in families applying to our program. The only prerequisite for applying to our program is to live within the city of Toronto. 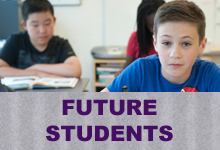 Families interested in applying are encouraged to check out the "Future Students" section of this website. Each year we audition approximately 500 children for entrance into our program. 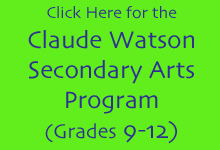 The Claude Watson Secondary Arts Program is based out of Earl Haig Secondary School. Their website is http://www.claudewatson.ca.